Hi Deb -- I love looking at your PL pages. They are not overly complicated and still look unique to you. I have a couple of questions for you... first, how do you shoot your pages in the book. You have very little reflection. Where is your light source? Are you inside or outside? I've tried several different methods and haven't figured out the right formula yet (overcast day, *golden hour* time, inside by a window, outside on a covered patio, in the shade). My second question, I read through your list of gear and I'm wondering which of your lenses you use the most? I'm an amateur photographer with my eye on getting a L series lens next. If I didn't have the Tamron 28-75 f/2.8, I'd probably get the L-series equivalent of it. To give you an idea of my needs, I mostly take pictures of my family (inside in our dark house and outside) and for the next few years will be taking pictures at preschool events (inside in bad lighting and outside) as the unofficial school photographer. I think I want to prime (35mm f/1.4L maybe)? I have the nifty fifty but don't use it much. Maybe I should replace that one?? It is too long to use in our house for me which is why I was looking at the 35mm. Anyway, I didn't mean to ramble on so, I'm mostly interested to know how you take your PL page shots. The rest I'm curious about since you are a photographer. Thank you for your time! Thank you, Lucia! I shoot my PL pages on my kitchen table because it is near a row of big windows. I shoot in the indirect light. Ideally you want to shoot close to where you can see the direct light, but not in it. I use the 24-105 f/4.0 lens just because I need the wider angle since I have them on a table. I would use the floor, but I just like the look of my brown table versus my wood floor which is more of a reddish brown. If you still can't figure out a way that works, feel free to email me some of your shots and I'll try to figure out what may be wrong. You can email me by clicking on the little envelope in the upper right portion of my blog. The lens I use most is my 50mm f/1.4. Since I have a full frame camera, this would be equivalent to roughly a 35mm lens if you have a crop sensor camera. I have tried the 24-70 L series lens when my neighbor rented it and I didn't like it as much as using a prime. I bought the 24-105 lens because I thought it would be a good lens to have when I can't carry around a lot of lens like on vacation so I could have a lot of versatility. I do wish it opened up wider, but other than that I like it. It's a very sharp lens. Anyway, I do think the 35mm 1.4L lens would be a good choice for you. The L series lenses do make a difference to me in the quality of the image. And that would be a good focal length for you since you feel like your 50 is too close. Plus it would open up wide for the indoor shots. I hope this helps! If you have any more questions let me know! Thank you so much for the detailed reply, Deb! Lots of good information in it. I think you have solidified my decision to get the 35 1.4L lens. I always forget to take into account the crop factor (I have the 7D and love it). Now it makes sense why so many with a full frame camera love the 50. It will be awhile yet before I can get the 35 L series but now I can focus on the amount I need to save up. And I think I'll try shooting my PL layout pictures inside again. We have one room in the house that gets decent light (but by no means good) and I seem to forget about it since there are always toys strewn about it (it's our playroom). I'll let you know if my pictures of my April pages turn out better. This looks fantastic!! 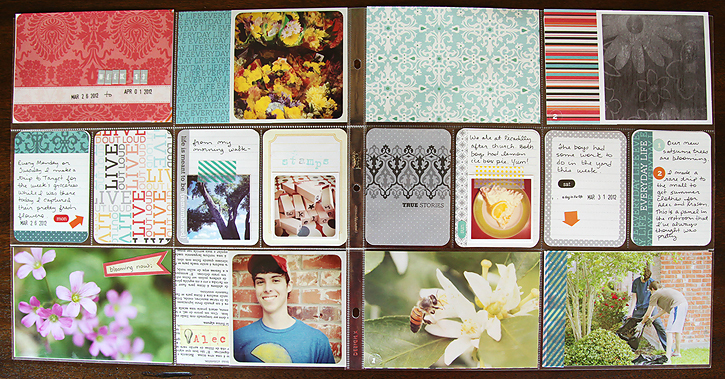 I am still loving mine, I print pics at the end of each month but keep the journal cards filled out so I remember all those moments! 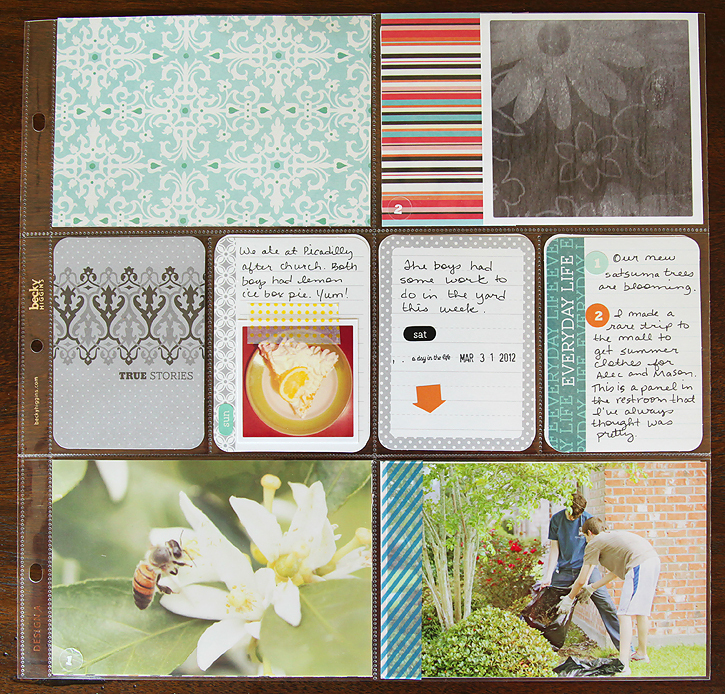 This month I am printing smaller instagram pics to go along with the larger one from each day! Super excited! What a great week Deb. Hope things are going well for you all. Hugs! This looks great! I wish I had the time to take on a project like this. The minute I do, I'm jumpin' in! Fum picture of the stamps and the boys working in the yard. You always take the best nature shots too. Looks like a good spring week. Lovely layout Deb - I always love your choice of colour for journalling cards etc and how well it looks together, and I love the dark pink and aqua this week. Gorgeous bee picture! Another great week Deb! LOVE so many of your photos, the bee shot is great, the flower one is stunning, and what a handsome guy. Those stamps also look lovely!! :) Smiles from South Africa! Looks great, I like your idea to make a picture private with paper. I have had some I didn't want to share but just pulled it out and left a big white space. 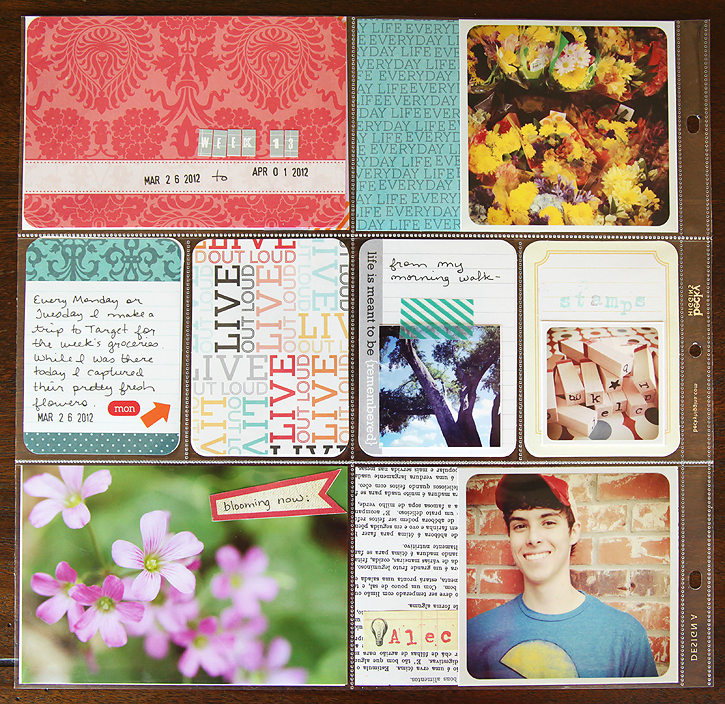 Your version is much prettier and more blogworthy :) I like how you added tape right over the entire photo, fun! i wish i could see this album completed... what a great story for your boys!